PIC is a nice little chip, but it does have it's limitations. However, there is a relatively cheap way to have a BASIC programmable microcontroller system. Some time in early 80-ies Intel produced a mask-prgrammed 8052 MCU which contained a floating-point Basic interpreter with lots of interesting features, including built-in support for EPROM storage of BASIC programs. There is a plethora of information scattered on the web about this chip, but no one place provides a complete set of instructions to get you started. This project is my attempt to provide just that. So, first of all, you need a 80C52 or compatible microcontroller. There are several producers, I used Atmel's AT89C52 which is FLASH based, so it can be reprogrammed (as opposed to 80C52 which is OTP part). Any 89C52 or 87C52 part will do fine for experimenting, but if you do not have a programmer for 8051 family of MCU-s, Atmel also has a AT89S8252 (8052 compatible chip with 2K of EEPROM built in) with a serial programming interface which makes building a programmer much easier. Once you have the controller, you need a board to stick it in. 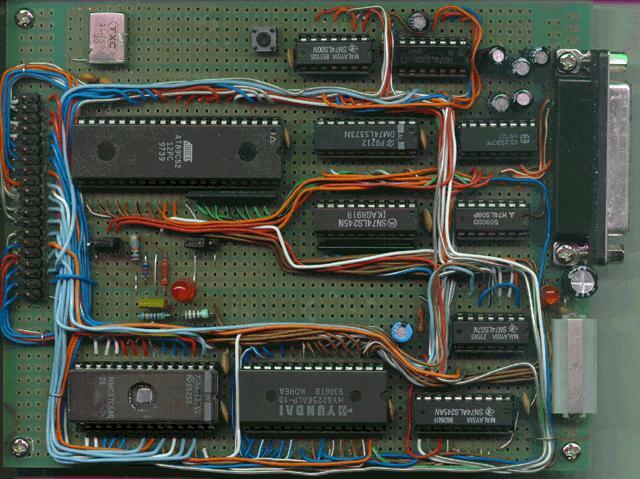 I built mine from scavanged parts and it has serial port, full data and address bus buffering, 32K static RAM and 8K or 16K of EPROM on board. I'm feeding this beast from standard PC power supply, using 12V for EPROM programming directly. National Semiconductor's 12.5V VPP parts seem to program just fine at 12V. Click here to see the schematics. Bear in mind that this was my first 8052-BASIC project, so the hardware is quite a bit overengineered on some parts while it misses some stuff that should be implemented in other parts. A better, lower chip count and fully implemented 8052-BASIC core is available here. The external code and data address spaces are combined into one. Code space is 8K of internal ROM followed by shared memory space which starts with RAM from 0, and continues with ROM from 8000H. The address space from C000H is not used on board, and is available for I/O or ROM expansion. Resistor pack RN2 is not required, but it does help to keep the data bus in order. 74245 chips can cause serious glitches on power and signal lines, make sure you have bypass caps near them. I initially used Soviet parts and was unable to get them to behave at all. JP3 allows to switch off internal ROM.when center pin is grounded. I built my version on one-sided perfboard, using point-to-point soldered wires (from phone cable) on component side. It's not the most convinient and best-looking, but it works. My version also has a RESET button in parallel with C7. When you get this far, things are looking good. Enter PRINT MTOP at prompt, you should get 32767 if you used 32K RAM. To verify EPROM cicruit, try entering PROG1 at prompt, if you do not get a programming error then you just wrote the baud rate to use into EPROM, and BASIC will not wait for keypress next time you start it. Before going on to literature and references, here are two programs that I wrote, the first of them has proved very valuable. It starts at 8000H and dumps pages until you press ESC at the prompt. The data is taken from external data memory space, you need to change XBY() to CBY() to read internal ROM, or DBY() to read internal register space. While 16K of EPROM is a lot compared to PIC memory space, it is nothing in todays information overload. For serious data logging, and just for fun, here is a schematic drawing for IDE drive interface. If you are willing to waste 50% of the disk space, and stretch the IDE interface specs a bit, you can leave out all IC-s except IC1, and connect LED directly to /DASP line. You will be able to read and write only lower 8 bits of the data words, but otherwise it will work just fine, because all control registers are 8-bit.However, I wanted to access all bytes, so I built extra register to capture high byte of the data word. IC1 decodes IDE command block registers at 0E000H-0E007H, IDE control block registers at 0E008H-0E00FH, and the extra data register at 0E010H. As usual, once I got the hardware working and concept proven I lost interest in the project so this is what I have and there is but a very little hope that there will be something more coming under this project..
BASIC-52 PROGRAMMING from Systronix Inc. is a sort of replacement for original Intel 8052AH-BASIC user manual. No circuits. The Microcontroller Idea Book by Jan Axelson, I have not yet received mine. contains lots of useful information and shcematics examples for 8052 BASIC and other widgets.